Kill Bill Vol. 2 is a much different movie than Vol. 1. Vol. 1 was short on story and heavy on action. Not that it was bad—I quite enjoyed it a lot, but Vol. 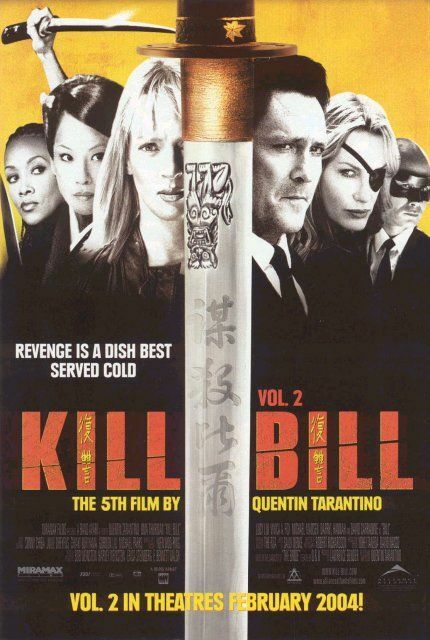 2 is more of classic Quentin Tarantino movie with lots of great dialog and deep characters. Uma Thurman plays “The Bride” (who does get named near the end of the movie, but in some odd bit of suspense gets her named unceremoniously bleeped out of dialog in the beginning). The Bride is out for revenge after Bill and the Deadly Viper Assassin Squad (of which she was a member) tried to kill her on her wedding day. To make the crime all the more heinous it turns out she was pregnant at the time—when she wakes up from her coma several years later she realizes her baby is gone. The question becomes, “Why did all this happen?” And this movie answers by delving into the background of The Bride, Bill, and some of the members of the Deadly Viper Assassin Squad. Particularly good is the part where The Bride trains under “Pai Mei” (apparently a regular character in old Kung Fu movies—I didn’t realize this as I haven’t really seen any old Kung Fu movies). Pai Mei is just a great character—he’s a crazy old Chinese guy with super human Kung Fu powers and a raging temper. The end surprised me—I won’t spoil it, but it was good. I thought the end fight with Bill was great—it was very short and underscores the style of this movie which is more about story and dialog than huge action sequences. It kind of reminded me of Reservoir Dogs which seemed like it was going to be an action movie, but instead skipped all the action scenes and showed the dramatic moments. There are only a couple fights in Kill Bill Vol. 2 and while they are all pretty short they are interesting and unique. I enjoyed Kill Bill Vol. 2 better than Vol. 1, but for completely different reasons. Vol. 2 is really a very different movie and, incidentally, stands on it’s own. The back story is explained in short order and though you may miss some subtle character points by skipping Vol. 1 you won’t be left in the cold (story-wise) at all. I would say you should definitely see Kill Bill Vol. 2 if you’ve liked any of Quentin Tarantino’s other movies at all (and you should see it if you’ve never seen any of his movies, just for a taste of what his style is like).